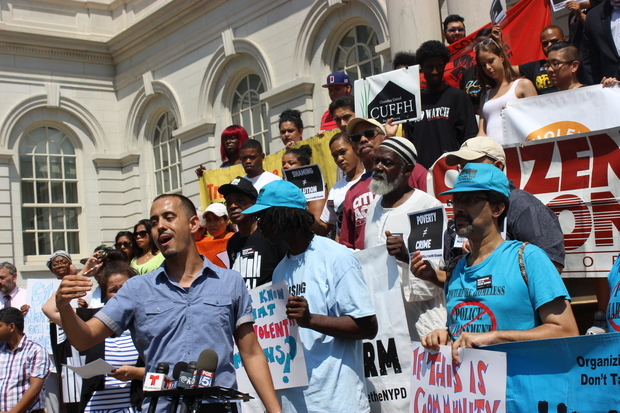 Jose Lopez of the group Make the Road New York said the homeless should not be used as political pawns at a City Hall rally where homeless groups supported efforts of the de Blasio administration to deal with the issue. "What we need are solutions, not shaming." CITY HALL — Mayor Bill de Blasio has blamed media coverage of homelessness for the public perception that it's a problem on the rise and out of control. "I think the media has put a lot of attention on this issue lately, more than previously," de Blasio said last week in response to a question about a DNAinfo New York story that showed 311 calls about the homeless had jumped 60 percent since he took office. "I'm not sure if the attention that's been given is proportionate to what's happening," he added. "I think it's caused people to be more and more concerned." On Tuesday, several homeless organizations rallied on the steps of City Hall and said de Blasio was right. The groups said the homeless were being used as political plays by the New York Post and the Sergeants Benevolent Association, who urged people to take pictures of homeless people they saw on the street, to damage the mayor. "All of this is a concentrated attack against the mayor and by extension progressive politics," said Joel Berg, executive director of the New York City Coalition Against Hunger. "Is the mayor perfect? No, and that's why I continue to advocate. But he's the best mayor on this issue in decades." City officials say that de Blasio inherited a homelessness problem from his predecessor, Michael Bloomberg, under whom homelessness soared. There were 53,000 homeless in the shelters when Bloomberg left office. His administration had cut rental subsidies for homeless families, and advocates say that only exacerbated the problem. In December 2014, under de Blasio, the homeless shelter population had ballooned to 59,000. That number has since dropped to 56,000 and de Blasio said the city is spending $1 billion more on homelessness over the next four years to address the issue further. The city also just announced NYC Safe, a $22 million effort designed to address mentally ill that are prone to violence. In spite of de Blasio's insistence that the program is targeted at both the homed and the homeless, NYC Safe devotes resources to the Department of Homeless Services to increase security and the availability of mental health providers inside city shelters. "We have a lot more resources with this administration yet the public thinks nothing is being done," said Christy Parque, executive director of Homeless Services United. Laura Mascuch, executive director of the Supportive Housing Network of New York, said the mayor has supported efforts to fund 35,000 new units of supportive housing, often an important step in transitioning the homeless to permanent housing. Despite the advocates' views, a recent Quinnipiac University poll found that 53 percent of city voters said they saw more homeless on the street than they did a few years ago and 49 percent say they have encountered more homeless people panhandling. Jeanne Zaino, a professor of political science at Iona College, said the de Blasio administration is doing a poor job of communicating with the public about the efforts its taking to reduce homelessness. "If there is one thing he should do it's to get out there and talk to people, speak with them honestly and directly and say: 'These are the numbers and here's what we are doing to combat them,'" said Zaino. She said the mayor should be doing more town halls and more radio shows where he can speak unfiltered to the public. Unlike past mayors, de Blasio does not appear on a weekly call-in radio show. But de Blasio is scheduled to be a guest on the Brian Lehrer show on WNYC Wednesday. It's unclear if he'll take questions from the public. "He's been one of the most cloistered mayors we've seen in a long time," Zaino said. "The longer this goes on the more people will feel that he is hiding."